The music on "Raw Voltage" is electronic, warm and full of momentum. Goudron is a modern craftsman of synthesis, structure and song. His music seems choreographed to a film, breaking down, starting up, fluctuating and adhering to rules that make his music sound like no other. His unique 'sound' comes in part from the fact that he modifies a lot of his gear himself; it also comes in part from the fact that he knows his machines inside and out. Watching him live, he masterfully manipulates analog synths without schematics - an amazing skill to those that truly know vintage analog gear. Goudron is Detroit artist and musician Ron Zakrin. 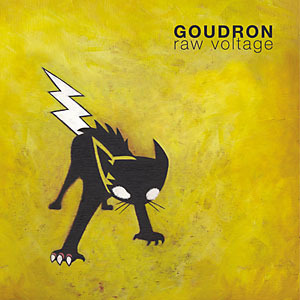 "Raw Voltage" is Goudron's first full length album after his two previously successful 12" releases on Ersatz Audio. 5 of the songs here on this CD were previously released on 12" vinyl releases on Ersatz Audio entitled "Horses & Chariots" and "Civil Symmetry". 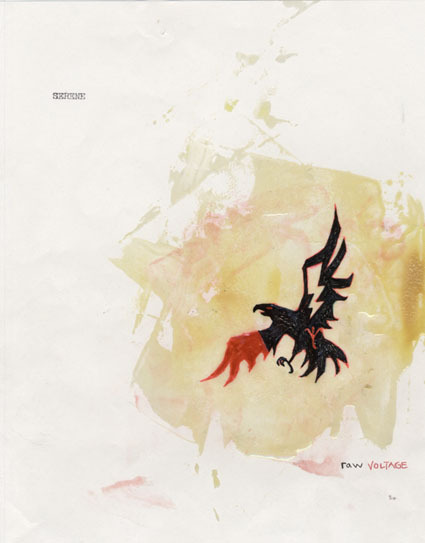 And like his previous 2 releases, this album also features the artwork of Mr. Zakrin. Goudron delivers an album of massive emotional depth, exciting mood swings and continual drive, creating a record that grows on the listener with every passing song. ORIGINAL CONCEPT FOR RAW VOLTAGE BY R. ZAKRIN.